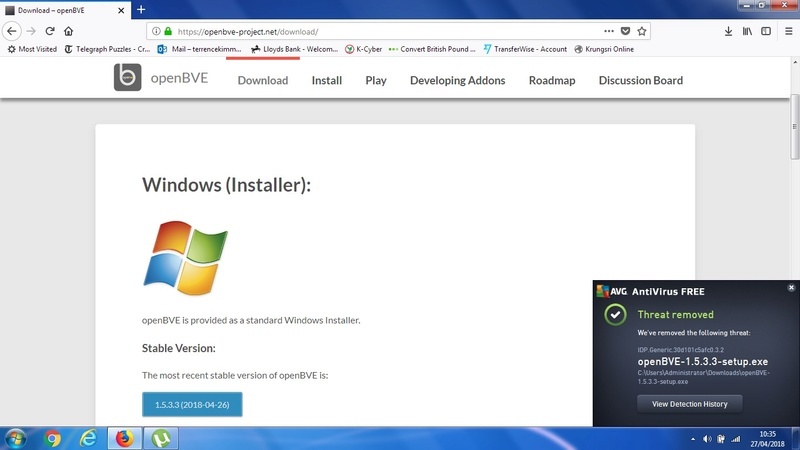 Very curious recent development: hitherto I've had no problem downloading the latest 'Open BVE' file and installing it. Now my anti-virus programme has blocked the download (see screenshot below). Of course, I could disable the anti-virus programme but maybe there is a problem with this download which I should take seriously. Any thoughts? Sadly, that happens regularily with virtually every update... It's a conceptual weakness of the heuristics behind AV software. You'll have to wait for Chris to kick the software vendors in their lower back again. Only detected by three of the smaller free AV vendors (Free AV tends to be more agressive), and if you give it a few days it'll unblock itself.